We hear a great deal about outdoor air pollution, but most of us don’t give much thought to the quality of air inside our homes. The Speck air-quality monitor will reveal one source of indoor air pollution: particulates. More specifically, the Speck—originally developed by Carnegie Mellon University’s CREATE Lab—measures the levels of fine inhalable particulates measuring .5 to 3 microns. These particles can lodge deep inside your lungs, leading to decreased lung function and the aggravation of chronic medical conditions such as asthma and heart disease, according to the EPA. They’re a mixture of solid particles and liquid droplets—including dust, soot, and smoke—and they can come from outside as well as inside your home, generated by everything from cooking meals on your stove to burning candles. The diminutive device is deceptively simple in appearance, measuring 4.5 inches wide, 3.5 inches high, and 3.7 inches deep. Inside its enclosure you’ll find an Atmel XMEGA processor, a 2.4GHz Wi-Fi adapter (802.11b/g), a very quiet intake fan, and enough onboard storage to retain two years of data (with one air sample taken each minute). If you create an online account with the manufacturer, the Speck will upload this data to your account. Those with privacy concerns can install a free and open-source Chrome app to download this data directly in the form of a CSV file. A near-silent fan on the side of the Speck pulls in air for analysis. Airviz recommends cleaning this intake with compressed air on a monthly basis. A 3.2-inch color touchscreen displays the most recent readings in either the number of particles measured per liter of air (ppL) or based on an estimate of mass in micrograms per cubic meter of air (μg/m3), but the app reports only the latter. The Speck also monitors ambient temperature and humidity levels inside the home, but it reports temperature only in Celsius. Android and iOS apps are available that will display this same information on your mobile device of choice. The app also reports the current air-quality index (AQI) for your location, whereas the onboard display reports outdoor air quality in much simpler terms (“good,” in my case, I’m happy to report). It’s worth noting that AQI measurements are drawn from a database of federal monitors within the U.S. (and a few in Canada and Mexico). Set up a Speck elsewhere in the world and it will be useful only for measuring indoor air quality. 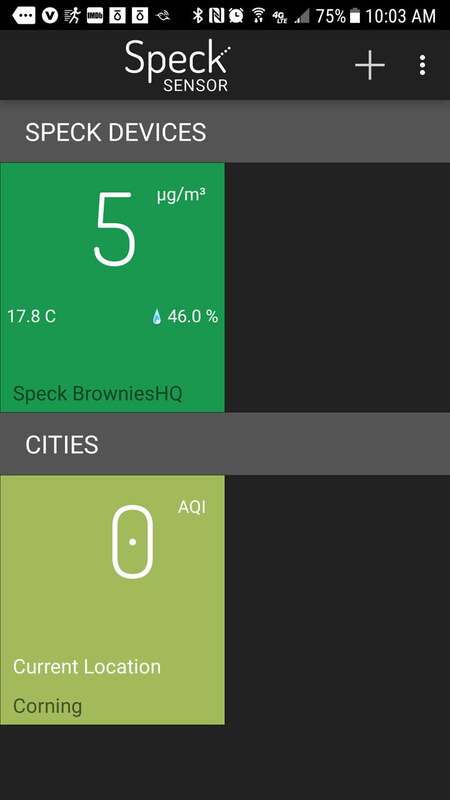 The very basic mobile app displays the amount of particulates in your home’s air (reported in micrograms per cubic meter of air), the ambient room temperature (but only in Celsius), relative humidity, and the air quality index report for your home’s location. I found it easiest to wrap my head around the ppL readings, but an arrow pointing to a stack of colored bars on the left-hand side of the unit’s display provides an even easier-to-understand indicator of your current indoor air quality. The deep-green block at the bottom of the display indicates a particle count of zero to 500 ppL (zero to 20 μg/m3), meaning there’s little chance of particulates in the air causing harm to your health. The red block at the top of the display warns that levels are unsafe (8,001 to 16,000 ppL, or 321 to 640 μg/m3), and that you’re at risk of long-term health effects if those levels are sustained. The app uses the same color scheme. 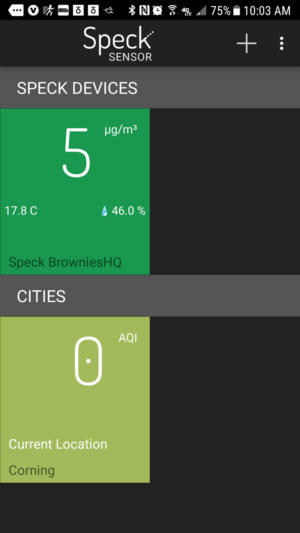 If you’d prefer to monitor your air quality based on micrograms per cubic meter of air (μg/m3), you can tap the value displayed on the Speck to toggle between the two units. I’ve been monitoring my home’s air with the Speck for about three months, in conjunction with 3M’s new Bluetooth-connected Filtrete Smart air filters (3M folds the Speck’s air-quality reporting into its own app). I’ll review the air filters in a separate review down the road. I’ve found the Speck’s reporting to be informative, as far as it goes, but the Speck would be much more useful if it generated an alert—via either an onboard speaker at least through its app—when my air quality deteriorated, so that I could take immediate action by opening a window or turning on a fan. 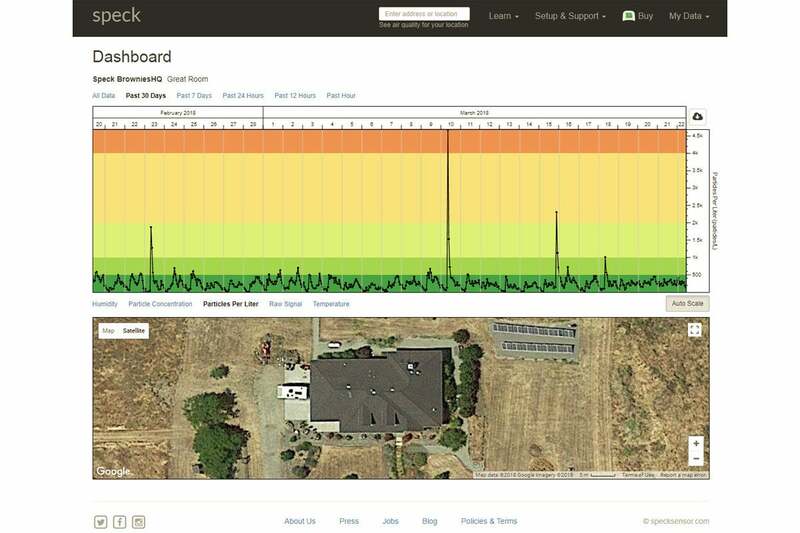 If you create an online account, you can see long-term reports on your indoor air quality, along with a map or satellite image of your location. If you’re concerned about privacy, you can download collected data directly from the device and not upload it to the cloud. As you can see from the screenshot above, the Speck did measure one extremely high spike in ppL on March 10. Looking back on my calendar, I remembered that I had prepared a steak that day by frying it on my gas cooktop at very high heat with butter and garlic in a cast-iron pan. That generated more smoke than my range hood was capable of capturing, and it also triggered one of my smoke/CO detectors. Had the Speck also generated an alarm, I would have opened some windows to bring in some fresh air. I instead just waved a towel under the smoke detector to clear the air around it so it would stop sounding off. Speaking of carbon monoxide, that’s one of the many indoor air pollutants the Speck cannot detect. 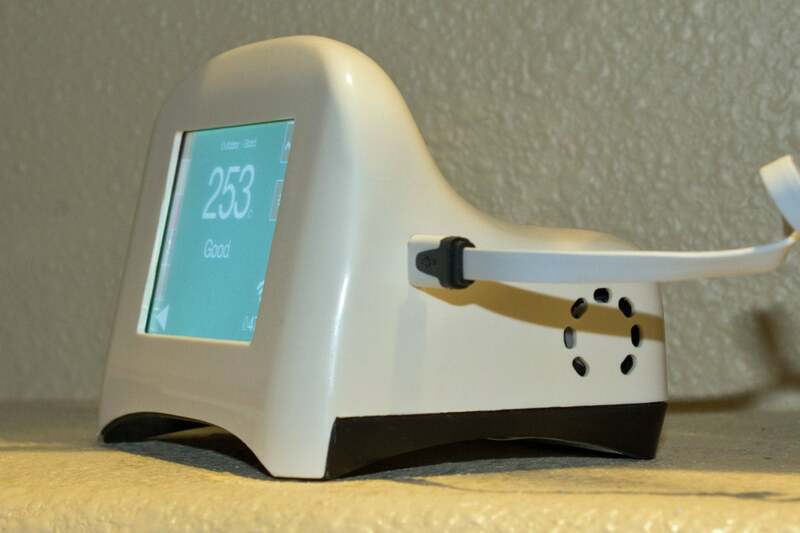 It is also incapable of measuring or alerting you to the presence of volatile organic compounds (VOCs), mold spores, carbon dioxide, radon, or anything else lurking in your home’s air that could compromise your respiratory health. Fortunately, many smoke detectors on the market today are also capable of detecting the presence of carbon monoxide (here’s our take on the best smart models). 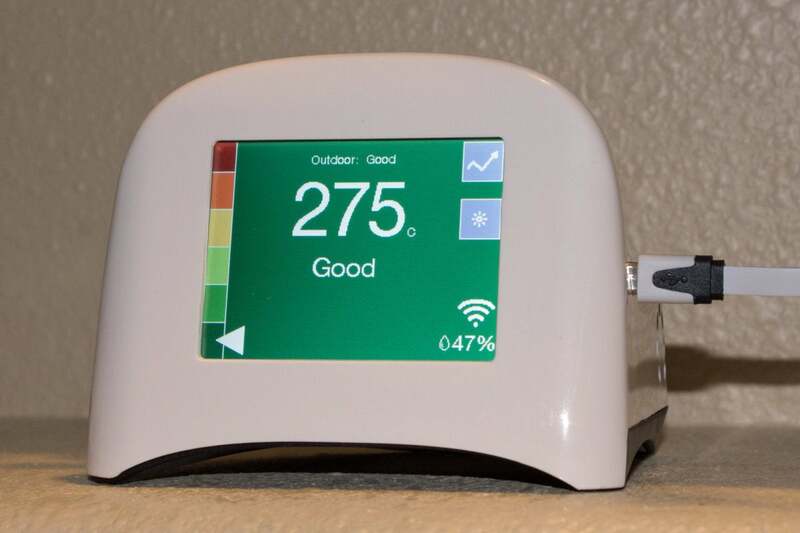 There are also dedicated radon detectors, such as the AirThings Wave we reviewed recently. If you or anyone else living in your home suffers from a compromised respiratory system, or if you’re just generally concerned about the quality of air in your home, the Speck can either provide peace of mind or prompt you to take steps to improve your home’s indoor air quality. Its sensor seems much more grounded in science than the jack-of-all-trades that’s built into the Canary home security system. But the Speck will be useful only if you monitor its readouts on a regular basis. Even then, it will only report levels of particulate matter in the air.